Installation of our basement floor systems can be done quickly and with minimal noise and disruption. Because our system installs without grout or adhesives, your flooring will be available for use immediately after the installation is complete. Installing new flooring -- and covering that cold concrete floor with something more inviting -- improves the value of the space and makes it feel much more like home. However, basements are unique spaces with unique requirements, and installing specialized basement flooring is your best bet to protect your investment. Each basement flooring option comes in several different color and options, combining to create almost any floor design you can imagine. Whether you want one of our finished floor systems or would like to use our unfinished flooring to create a custom design, we have the product that's right for you! To learn more about which products are available for you, contact us by phone or e-mail today! Along with your free quote, we'll send along a a complimentary copy of our full-color basement book! Our dealers have been helping homeowners throughout North America, Ireland, and the United Kingdom since 1987, and we want to help you! 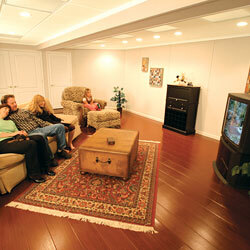 Which Basement Flooring Product Is Best For You? Our basement flooring products have been designed by basement waterproofers, who have seen conventional flooring products fail again and again in the potentially damp or humid basement environment. 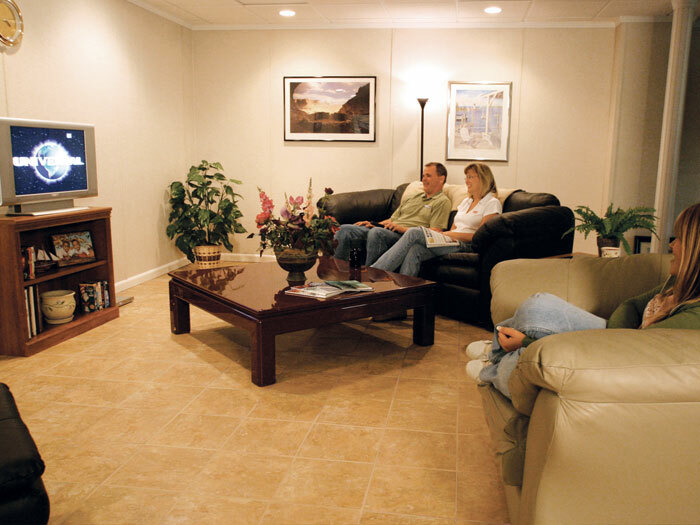 We're proud to say that each of our basement flooring options are designed to resist damage from water and mold growth, while also being fully compatible with our basement drain systems. No wonder that it's one of our most popular basement services! Your basement carpet and sub floor system should be waterproof to protect it from humidity, groundwater intrusion, and potential plumbing failures. Our carpeted floor tiles are available in mocha and charcoal designs. 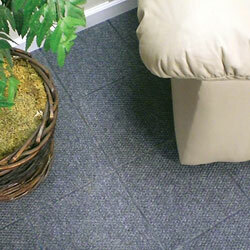 We also provide waterproof subfloor tiles that protects custom carpeting from humidity from the slab floor. Natural wood floors can be ruined by flooding and will swell and buckle with moisture. Inorganic flooring can provide the beauty of wood flooring without the inherent disadvantages. Our synthetic wood flooring is available in natural oak, rosewood, and mahogany designs. We also provide an inorganic, waterproof parquet flooring design that simulates wood floor tiles. Our floor tiles are warmer than stone, ceramic, and marble tiles and install without grout or adhesives. Your new floor will be 8-10 °F warmer than the concrete floor slab. Our vinyl floor tile system is available in canyon beige and sandstone gray designs. Our interlocking tiled floor design is fully integrative with both our carpeted and parquet floor tile options. We Can Upgrade Your Basement Walls! Your local Basement Systems Dealer would be happy to help you design a custom basement floor that is perfect for your needs. Contact us by phone or e-mail today, and we'll provide you with a basement floor finishing quote at no cost or obligation. Our free quote includes a professional consultation, an on-site inspection, and a personalized cost quote for your basement. We'll also provide you with a complimentary copy of our full-color basement book for you to keep. Our international network proudly serves throughout North America, The United Kingdom, and Ireland. There's a locally owned and operated dealer working in your neighborhood! Our ThermalDry® Carpeted Floor Tiles use an interlocking design to create a floating floor system in your home. These floor tiles create a floor and sub floor system in one -- with no need to install plywood or a wood sub floor underneath that can be damaged by moisture. These floor tiles feature a completely inorganic design, making them perfect for the basement environment. They will not support the growth of mold, mildew, or rot, and they will not be damaged by water or humidity. As water collects behind the wall panels, it will be directed downwards into the perimeter drain system. Sometimes, homeowners will opt for a custom carpeting design that matches a specific color scheme, or matches the decor in the main area of their home. That's where ThermalDry® Sub Floor Matting comes in! 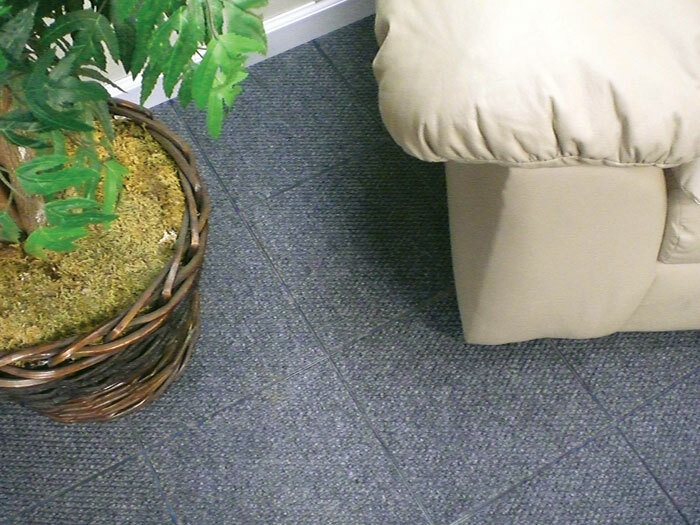 This floor matting is designed with interlocking plastic tiles that are completely inorganic, and connect together to create a vapor barrier on your basement floor. Each peg rests on raised plastic pegs, creating an airspace below and a thermal break between your floor and the cold concrete. This makes your the surface of our floor matting 8-10 °F than the cold concrete below. The innovative MillCreek Basement Floor system combines the beauty of natural hardwood with a durable, inorganic design. The unique interlocking design and inorganic makeup of each part of the MillCreek floor system is perfect for the basement environment -- resisting damage to water while creating a vapor barrier on your basement floor. 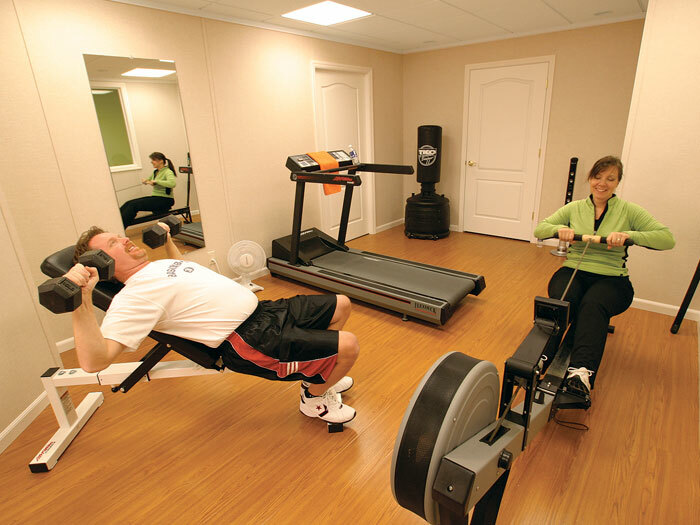 MillCreek is designed with the sometimes humid or damp basement environment in mind. It is impervious to damage from mold mildew, or rot, while resisting damage from moisture and humidity. And because it does not absorb water, it will not swell and buckle in the event of basement flooding. Traditional parquet flooring is beautiful when installed! Unfortunately, flooring that incorporates organic materials such as wood, glues, and resins in its design are inappropriate for use in a finished basement. Humidity rising upwards from the concrete can collect underneath a parquet floor, saturating the wood and leading to mold, mildew, rot, and musty odors. Wet parquet floors made with wood will also discolor, creating an eyesore. ThermalDry® Parquet Flooring is complete inorganic, and will not be damaged by water or humidity. 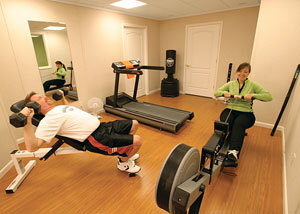 Its floating floor design installs quickly, making your floor usable immediately after installation. Stone, ceramic, and marble tile is cold and hard in a basement, and grout lines will need continual maintenance to prevent them from discoloring with mildew. ThermalDry® tiled flooring provides a warmer, more forgiving surface -- one that looks fantastic in a finished basement. Because each tile sits on raised plastic pegs, the surface of the tiles is 8-10 °F warmer than the cold concrete below. These tiles install quickly in your basement. With no grout lines to maintain, they'll stay looking great for many years to come -- with no maintenance required! Mixing and matching your ThermalDry® Carpeted flooring with a tiled system is a great way to give your basement a sophisticated, architectural look. The interlocking system provided by all ThermalDry® products makes this possible -- each tile is interchangeable with another. And because no additional sub floor system is needed with the installation, you save up to 3&afrac12;" of valuable ceiling space in your basement. With no grout or adhesives, this also makes removing and replacing damaged tiles a breeze! Simply pull out the old tile and replace it with a new one, and your floor is ready to be used! Combining ThermalDry® Parquet Floor Tiles with other tiles is a great way to set aside a different area in a finished basement. Use the quiet, comfortable carpeted tiles in a living room area, and then switch to a parquet or tiled design for a bathroom, kitchen area, or workspace. No matter which design your choose for your finished space, you can be sure that our warranted ThermalDry® Systems will stay looking great -- even if your basement encounters damp or humid conditions. 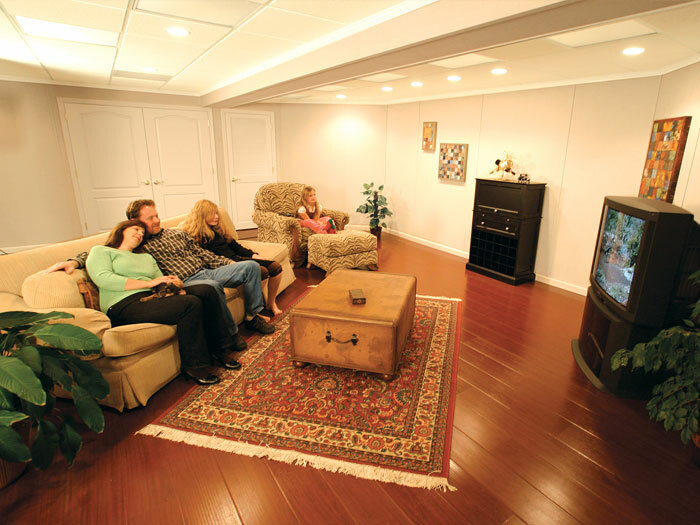 The three ThermalDry® finished floor systems combine for a warmer, healthier, more beautiful basement space! Basement Systems, Inc. © 2002-2011. All Rights Reserved. * What is a Free Estimate and Inspection? A system design specialist from one of our dealerships will inspect and measure your basement or crawl space completely FREE of charge. You will also receive one of our books (valued at US$14.95) at no cost to you including free shipping. 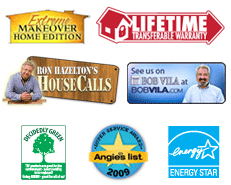 ** Warranties vary by product and service. Check with your local dealership for specific warranty information.